Abstract | Due to the climatic change, manual cropping leads toward great loss. Mechanization of the crop is very important tool to increase its profitability. For this purpose, an experiment was conducted to evaluate the genetic diversity among 36 lentil genotypes for mechanized harvesting. Analysis of variance for qualitative and quantitative traits showed significant variability among the genotypes. Correlation analysis indicates negative correlation of yield with lowest pod height and highly significant correlation between lowest pod height and plant height. Cluster analysis performed for qualitative and quantitative traits separately. It was observed that genotypes with suitable plant type for mechanized harvesting belongs to different cluster and high yielding genotypes belongs to another cluster. It indicates that the genotypes suitable for mechanized harvesting are not high yielding. So, it is advisable to use genotypes in the ideotype breeding program to enhance the desirable variation. Citation | Jawad, M., S.R. Malik, M.A. Sarwar, M. Asadullah, I. Hussain and R. Khalid. 2018. Genetic analysis of lentil (Lens culinaris) exotic germplasm to identify genotypes suitable for mechanical harvesting. 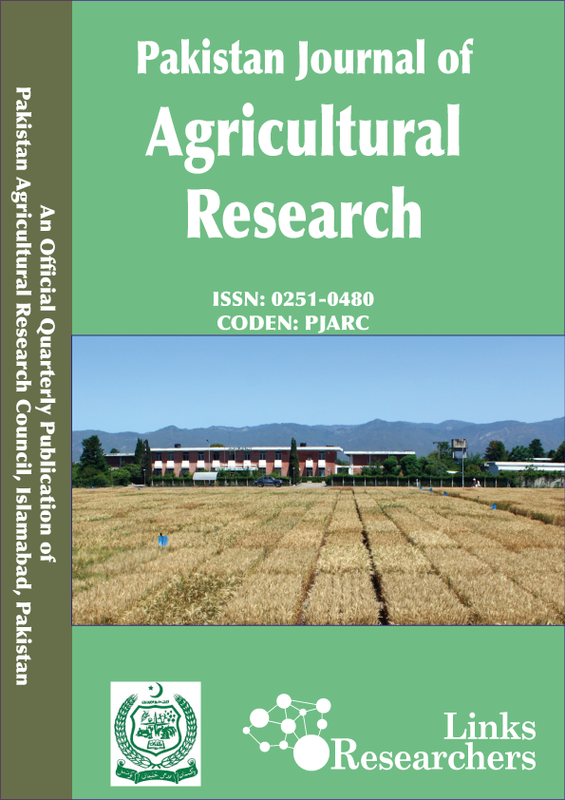 Pakistan Journal of Agricultural Research, 32(1): 152-158. Lentil is a cool season grain legume mostly grown in the Middle East to Mediterranean region, Asia and Europe. It is considered to be the first agriculture crop grown more than 8500 years ago (Aghili et al., 2012). This crop is mostly ignored and grown in marginal lands where annual rainfall is less (Oplinger et al., 1990). It has high protein contents 22 to 35%, therefore it is a good supplemental source of cereal grain diet. Canada is the largest producer of lentil and produces 2.5 million tons followed by India, Turkey and Nepal (FAOSTAT, 2017). By 2030, the estimated consumption of lentil would increase to 5.5MT indicating 2MT more production from the present will be required to fulfil the demand (Clancey, 2009). Lentil area and production is continuously decreasing in Pakistan from last two decades i.e. 69.4 thousand hectares in 1997 to 39 thousand hectares in 2007 and 17.4 thousand hectares in 2017. Similarly decreasing trend of production i.e. 34.9 thousand tons to 21 thousand tons from 1997 to 2007 and 8.6 thousand tons in 2017 (FAOSTAT). The main factors responsible for this decrease are the unavailability of quality seed of improved varieties, poor weed management and lack of mechanized harvesting. These factors made the crop non-profitable and it cannot compete with other crops. Hence with the passage of time farmers shifted towards other highly productive and profitable crops like wheat. Although this crop is an essential part of sustainable agriculture cropping system. Lentil plays a vital role in food and nutritional security due to the high protein contents in the seed (Sarker and Shiv, 2011). It also has an important role as a rotation crop and increase the soil fertility and providing the better production environment for other crops (Yantai et al., 2017). In the modern era of farming, crop mechanization is an important parameter to facilitate farmers. The farm families of advanced countries are completely shifted towards mechanization. With the help of mechanized harvesting, the exposure of mature crop to climatic change can be reduced and the yield losses can be minimized. And mechanization also increase the profitability of the crop by minimizing the production cost due to expensive labor. For the mechanization of crop very first step is to produce such varieties suitable for mechanical harvesting. For this, screening of germplasm is needed to identify the suitable plant ideotype for mechanization with higher yield. Cluster analysis can be a good source to identify the variation in the germplasm and to classify based on similarity and dissimilarity index. This analysis is also useful for the selection of parents for the breeding program and crop modeling (El-Deeb and Mohamed, 1999; Jaynes et al., 2003). Availability of genetic diversity is the major key to develop ideal plant type. The principle aim of this study was to determine the genetic diversity in lentil germplasm based on plant type, seed quality and yield. For this study, 36 genotypes were used that are acquired from International Centre for Agriculture research in Dry areas (ICARDA). The germplasm was evaluated in Randomized complete Block Design with two replications during the Rabi season of 2016-17 (Table 1). Two rows of each entry were planted having row-row distance of 30cm with 5cm plant to plant distance and 4m row length. All the recommended cultural practices were followed to raise the healthy crop. Days to 50% flowering and days to 90% maturity were recorded on the plot basis. Five guarded plants in each plot were used to record the plant height, lowest pod height, grain yield, seed size, seed color, lodging and pattern of testa. The data were recorded according to the lentil descriptor published by IBPGR and ICARDA in 1985 (Table 2). The data was statistically analyzed by analysis of variance (ANOVA) as suggested by (Gomez and Gomez, 1984). The heritability and genetic advance of the traits were calculated by the formula given by (Falconer, 1981). Correlation and cluster analysis were performed with statistical software, SPSS 16.0. The analysis of variance showed that all the qualitative (seed size, seed color and pattern of testa) and quantitative parameters (lodging score days to 50% flowering, days to 90% maturity, plant height, lowest pod height and grain yield) were highly significant (P <0.01). Mean squares and F statistic of different agronomic parameters are presented in Table 3. The mean values of agro-morphological traits are given in Table 4. It was observed that genotype 36 was the highest producing line with the average yield of 2295 kg/ha. The highest plant height was observed in Genotype 9 i.e. 63.25cm with the lowest pod height of 25.75cm. The Genotype 30 was found to be the earliest maturing line that matures in 141 days. Genotype 31 was found most resistant against lodging with 0 lodging score. Most of the genotypes have plain testa with green and brown seed color with few of them having spots on it. The only genotype 36 has doted testa. Similarly, most of genotypes have medium to large seed size with only 3 genotypes have small seed size. (Table 4). The genotypic, phenotypic variances, broad sense heritability and genetic advance for all the traits are given in Table 5. The genotypic and phenotypic variances were medium to high for days to 50% flowering, days to 90% maturity, lowest pod height, lodging score, plant height and yield kg/ha. Small variance was observed in other qualitative traits i.e. pattern of testa, seed color and seed size. The high broad sense heritability was observed for all the traits. Low to medium heritability i.e. 31.6% is the lowest value of yield and 48.9% highest value for days to 50% flowering indicates that the limited amount of variation is available in the germplasm, and the simple selection is of no use. More diverse germplasm is required from the gene bank to broaden the genetic base of the crop. Hybridization or mutation can also be a helpful tool to enhance the genetic base and improvement of desired parameter (Karin et al., 2016). Table 1: Detail of genotypes used in experiment. Table 2: Scale used for data recording of qualitative traits. Table 3: Analysis of variance of different quantitative and qualitative traits. character however it had negative and significant association with lowest pod height. Aghili et al., 2012 also reported that there is no relationship between lowest pod height and yield. no any relationship of lowest pod height and yield. Direct selection cannot be made with genotypes having high yield and high lowest pod height. The suitable plant types can be utilized in breeding program. Lodging score and days to 50% flowering didn’t show any significant correlation among the traits under studied. These results are in contradiction with (Erskine and Goodrich, 1988) where the lodging score had positive significant correlation with plant height and time to maturity. Tyagi et al., 2012 also reported similar results in peas, where lodging score had positive significant correlation with other yield attributing traits. Days to 90% maturity had significant correlation with plant height (0.343*), lowest pod height (0.344*) and seed size (0.340*) but it shows negative significant correlation with seed color (-0.357*) and didn’t show any significant correlation with other traits under studied. Plant height showed highly significant correlation (0.735**) with lowest pod height but it showed negative significant correlation with seed color (-0.332*). Similar relation of days to maturity with other traits was also reported by (Chakherchaman et al., 2009; Karadavut, 2009; Kumar et al., 2017; Tyagi and Khan, 2010). Hierarchical Cluster analysis was performed separately on qualitative and quantitative parameters. For both the parameters dendrogram grouped the genotypes into three main clusters (Figure 1). For qualitative parameters, Cluster 1 was comprised of 15 genotypes, 5 genotypes fall in cluster 2 and 16 genotypes belongs to cluster 3. The mean value of seed size in cluster 1 was 3 and 2 in cluster 2 and cluster 3 with SD 0, 0.4 and 0.7 respectively. It shows all the genotypes in cluster 1 have bold seed size, cluster 2 and cluster 3 have mostly medium seeded genotypes. Table 4: Mean performance of 36 lentil genotypes based on morphological traits. The mean value for seed color in cluster 1, cluster 2 and cluster 3 were 1, 3 and 3 with the SD value 0.4, 0 and 0 respectively. It indicates that all the genotypes in cluster 2 and cluster 3 have brown seed color and most of the genotypes in cluster 1 have green seed color. Similarly, the mean value for pattern on seed coat was 1 in Cluster 1 and cluster 3 and mean value of 3 in cluster 2 with the SD value of 0 for cluster 1 and cluster 2 and 0.25 in cluster 3. All the genotypes have plain seed coat in cluster 1 and cluster 3 except one genotype that have dotted pattern on testa. And all spotted seed coat pattern genotypes grouped in cluster 2 (Table 7). For quantitative traits, cluster 1 consists of 15 genotypes and cluster 3 comprised of 20 genotypes. Cluster 2 only include single genotype i.e. Genotype 36. Table 5: Genetic parameters of various traits under studied. M + S.E.D: Mean + Standard error of difference; PV: Phenotypic Variance; GV: Genotypic Variance; BSH: Broad sense heritability; GA: Genetic advance. Table 6: Correlation among eight parameters in lentil. *Note: D50%F: Days to 50% flowering; D90%M: Days to 90% Maturity; LPH cm: Lowest pod height in cm; LS: Lodging score; PH cm: Plant Height in cm; PT: Pattern on testa; SC: Seed color; SS: Seed size; GY: Grain yield. The mean value of lodging score in Cluster 1 was 4.6, 5 in cluster 2 and 3 in cluster 3 with SD value of 1.5 in Cluster 1 and Cluster 2. The cluster for lodging score indicates that the genotypes in cluster 1 and cluster 2 are almost the same lodging susceptibility and genotypes in cluster 3 are more lodging resistant. Mean value for days to 50% flowering was 107 days in cluster 1, 105 days in cluster 2 and 99 in cluster 3. It shows that genotypes in cluster 1 and cluster 2 are not very distinct for days to 50% flowering as compared to Cluster 3. The days to 90% maturity for the genotypes in Cluster 1 and Cluster 2 was the same i.e. 146 days. In Cluster 3, it was 141 days which is significantly different from other clusters. Table 7: Mean and standard deviation for six quantitative traits in clusters. Table 8: Mean and standard deviation for three qualitative traits in clusters. The mean value of plant height in genotypes of Cluster 1 and cluster 3 was 48 cm and in Cluster 2 the mean value was 52 cm. Similarly, the lowest pod height of the genotypes in cluster 2 was highest i.e. 22.2 cm. In cluster 1 lowest pod height was lowest i.e. 17.7 cm and 19.8 cm in cluster 3. The highest mean yield was observed in cluster 3 i.e. 2300 kg/ha. In Cluster 1, mean yield was 1758 kg/ha and lowest yield was observed in Cluster 2 i.e. 1200 kg/ha (Table 8). The results of hierarchal cluster analysis help to increase the precision in the selection of suitable genotype by detecting the similar genotypes. (Bacchi et al., 2010) separated the population of lentil based on the type of seed. By observing the dendrogram we can distinguish suitable genotypes for mechanization, high yield and seed quality parameters. In conclusion, this research was helpful for extracting the genetic variation from germplasm in relevance to mechanized harvesting. Genotype 4 and Genotype 31 are the most suitable lines for mechanized harvesting having good plant height and lowest pod height with lodging resistance. But the yield is significantly different from high yielding lines. As the maximum yield was observed in the check variety, therefore, direct selection of any line based on yield is impact less. So, the suitable genotypes for mechanized harvesting can be used along with local high yielding genotypes as a parent in hybridization breeding program to create the desirable variation. Furthermore, qualitative parameters can be used as a marker for testing the genetic purity and hybridity at final level. Genetic marker assisted breeding can also be used to precise the hybridization. Muhammad Jawad conducted experiment, collected data and wrote the article. Shahid Riaz Malik conceived the idea and reviewed the article . Muhammad Aqeel Sarwar, Muhammad Asadullah and Israr Hussain provided technical inputs at every step and helped in data recording. Rabia Khalid did statistical analysis. Aghili, P., A.I. Ali, S. Hossein and A. Yousef. 2012. Study of correlation and relationships between seed yield and yield components in Lentil (Lens culinaris Medik). Ann. Biol. Res. 3: 5042-5045. Chakherchaman, S.A., M. Hossein, I. Leila and R.E. Mohammad. 2009. Evaluation of drought tolerance in lentil advanced genotypes in Ardabil region, Iran. 7. Clancey, B. 2009. Report to the saskatchewan pulse growers. World pulse outlook. 17. El-Deeb, A.A. and N.A. Mohamed. 1999. Factor and cluster analysis for some quantitative characters in sesame (Sesamum indicum L.). Ann. Conf. ISSR, Cairo Univ. 34. Falconer, D.S. 1981. Introduction to quantitative genetics. Longmans Green, London/New York. 2. Gomez, K.A. and A.A. Gomez. 1984. Statistical procedures for agricultural research. John wiley and sons, NewYork. Karadavut, U. 2009. Path analysis for yield and yield components in lentil (Lens culinaris medik.). Turk. J. Field Crops. 14: 97-104. Karin, S.P., L.A. Kelly and A.P. Amanda. 2016. Hybridization as a facilitator of species range expansion. Proc. Biol. Sci. Oplinger, E.S., L.L. Hardman, A.R. Kaminski, K.A. Kelling and J.D. Doll. 1990. lentil. Department of agronomy and plant genetics, University of minnesota, St. Paul. Field Crops M. MN 55108. Tyagi, N., A.K. Singh, V.P. Rai, S. kumar and C.P. Srivastava. 2012. Genetic variability studies for lodging resistance and yield attributes in pea (Pisum sativum L.). J. Food Legumes. 25: 179-182. Tyagi, S.D. and M.H. Khan. 2010. Studies on genetic variability and interrelationship among the different traits in Microsperma lentil (Lens culinaris Medik). J. Agric. Biotechnol. Sustainable Dev. 2: 15-20.